For a very long time, like, probably over 5 years, I've been wanting to revamp iceteks.com and anythingforums.com and redo the sites/forum as they are very old (some code is like 13 years old!). uogateway.com is fairly new in comparison but I will redo that one too. The goal is to combine all 3 site forums into a single forum. Also anything that requires a login will be unified into a single login. For uogateway.com you need a login to submit a shard, for example. That will be the same login as the forum. The actual forum will most likely be 1 forum for all sites, it's just easier to manage that way, and also will have the benefit of combining traffic into a single place. Hopefully it will be easier to promote that way. I've barely started yet but I do have a dev environment ready to rock and roll. 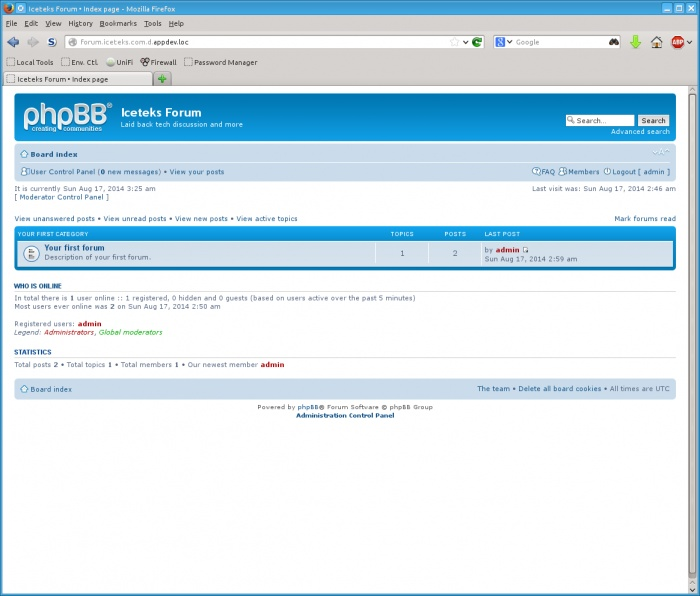 This will be a big deployment as I will need to convert all the posts from the 3 forums into a single forum. This will be more involved than simply moving data to a new database with different field names as I can't keep the same post/topic etc IDs. I have not fully decided what the plan is but I have some general idea. I'm also an uptime evangelist, I've seen places take on a project like this but they take down the forum for DAYS! Nope nope nope nope. I will not do that (even though two of the forums are pretty much broken at this point due to a php update) The whole process will happen locally on my dev server, be pushed to test for further testing, then uploaded. The DB conversion will probably be done offline as I have that luxery given the forums don't get much activity. One of the main reasons the forums died off as well was spammers. I had to turn off registrations, it just got insane. This new revamp will incorporate a sign up page that is separate from the forum, and will have some anti spam/bot measures. Still need to research that, but I think just having a separate form alone may help things. Also having 1 forum to moderate will help. Can't stop all spammers but can at least try to reduce them. This should be a fun ride, I have not updated any of my sites in FOREVER. Will actually be nice to have something more modern going on again, and hopefully I can add more articles and other content and get some traffic flowing again. I may even convert this blog over to a self hosted solution. TBH this blog was quickly thought out originally and not really used much, I'm normally not a fan of hosting stuff in a system I don't control. Been roughly 2 months now since I had LASIK. Vision is still good, and it feels pretty much just as good as with glasses before. I still get floaters but I think it's true what they say that your brain just learns to ignore them as I am seeing them less and less unless I think about it. Night vision is always improving. Contrast is a bit better than it was before, and halos are slowly going away. Overall still very happy with the surgery, it's great not having to worry about rain as much as I don't get droplets in glasses anymore. That was one of the most annoying things ever. That, and other debris/dirt getting in glasses is pretty much what drove me to get the surgery in first place. It's also great to no longer worry about where I sit in a restaurant or other place as I don't have to worry about reflections from light sources behind me. That is a huge issue with glasses, it seems no anti glare in the world works 100%. As squeemish as I am when it comes to eyes, if I was able to go through this, anyone can, if you are thinking about it, DO IT! Oddly, I still have trouble watching videos of the procedure being done. It's like when you're on the table at the heat of the moment you are so anxious you actually are overloaded with thoughts and worry and forget what is actually happening, and that actually makes it easier to go through.